Efforts by Bill Hannegan to attack Tobacco Free St. Louis and Pat Lindsey, who plays a leading role in this organization, seem to have fizzled, according to this latest article by St. Louis Post-Dispatch reporter, Margaret Gillerman. (In a response to this blog, Mr. Hannegan denies any intention to attack either Tobacco Free or Pat Lindsey. Clearly one of the main jobs assigned to Tobacco Free St. Louis was the altering of existing public smoking ordinances in St. Louis County. That sort of assignment is not permitted to 501(c)(3) organizations. The Health Department chose the wrong group for this task. St Louis County paid them with taxpayer dollars. A goal of recieving that money is to change law. While there is a grey area between education and lobbying, a goal of changing a law is lobbying. You have the health department giving a group with tax exempt status tax dollars to pressure its bosses, the county council to change a law that voters have already voted on. Yet the county wants to close parks, is laying off employeess and has further cuts to consider. No. You should do MORE than that Mr. H. You should seek a legal remedy to balance the damage TFSTL has done with their activity. At a minimum that remedy should consist of a fair estimation of the money spent inappropriately and a grant to the opposition organization of an equal amount. I say “at a minimum” because that doesn’t actually include any sort of punitive damages: it’s simple redress. If the shoe was on the other foot, they wouldn’t hesitate for a split second. Well, they keep yelling about wanting “a level playing field” – – Give them one! According to IRS regulations (http://www.irs.gov/irm/part7/irm_07-027-019.html), direct lobbying consists of “attempts to influence legislation through communications with members or employees of a legislative body and other officials who may participate in the formulation of legislation” and requires that the communication (1) “refers to specific legislation” and (2) “reflects a view on such legislation”. The rules further extend this to “Grassroots Lobbying” under the same general conditions. It is clear that the activities of Tobacco-Free St. Louis, regardless of the rhetoric used to cloak the intentions, is lobbying under the IRS definition, whether or not the proponents choose to conceal the true nature of the activities by calling them “education” or “advocacy”. An IRS determination as to the propriety of this activity is in order, as well as full, detailed disclosure of all expenditures by Tobacco-Free St. Louis, St. Louis University, and St. Louis County. 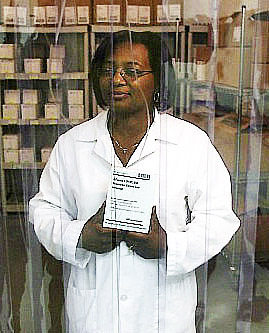 Dr. Dolores Gunn, St. Louis County Director of Health, posing on October 5, 2009, for a photo in a freezer unit. She is holding a package containing a vaccine for the H1N1 virus at a distribution facility in Earth City. CLAYTON • St. Louis County’s health director, Dr. Dolores Gunn, said Thursday that an anti-smoking organization had broken no tax law in its use of federal grant money. Hannegan said that his own activist group on the other side of the issue had to pay taxes on its efforts but that Tobacco Free did not. “They’re getting a free ride,” he said. The Tobacco Free money came from a $7.6 million federal grant the county got for anti-smoking efforts. Gunn said that Tobacco Free, one of several groups that got money, says its goals include education and advocacy campaigns to the County Council and general public about the need to remove exemptions from the county’s smoke-free ordinance. On Jan. 26, the group held a news conference where community leaders talked about the dangers of smoking and the problem with exemptions. Gunn told Hannegan he was confusing “lobbying” with “education and advocacy.” Hannegan disagreed. The latter is permitted by the Internal Revenue Service, Gunn said. Gunn said that St. Louis University, and not Tobacco Free, was the fiscal agent for the grant money being spent through Tobacco Free. “To my knowledge, the university and the activities being managed … are fully in compliance with the contract and all applicable federal laws and reporting requirements,” Gunn wrote. MoGASP, I was never out to atttack Tobacco Free St. Louis or Pat Lindsey. I only asked that they begin to comply with 501(c)(3) rules. Lately Tobacco Free St. Louis Directors have abstained from directly lobbying the St. Louis County Council. That is all I was asking them to do.